Rockstar is justifiably one of the most well-regarded publishers and developers in the industry. The company has tremendous positive equity with both consumers and the gaming press, delivering one critically-acclaimed AAA title after another. Many of the reasons Rockstar is such a powerhouse are relatively evident. To name a few: technical excellence, engaging gameplay, “it’s not done till it’s perfect” development cycles and judicious choices of games to produce. But one thing that may not be so evident is the studio’s strategic focus. Rockstar is strategically innovative in gameplay development and feature implementation such that it suggests awareness, if not pursuit, of Blue Ocean Strategy. At the most basic level a Blue Ocean Strategy, which was set forth by W. Chan Kim and Renée Mauborgne in the 2005 book, focuses on value innovation such that a company is able to create an uncontested, new market of customers. While this is not what Rockstar has done (they still compete in an existing market for existing gamers) the company seems to nonetheless incorporate certain tenets of Blue Ocean Strategy into their game design. Rockstar has become well known for offering in-game entertainment: the radio and TV stations in Grand Theft Auto IV and the short movies in Red Dead Redemption are the most recent examples. In a Blue Ocean strategy that is also delineated in the college-favorite article Marketing Myopia, Rockstar is rethinking who their customer is and what they want. Condense it down far enough and Rockstar is in the entertainment business – so they offer additional, in-game entertainment for players. Rockstar is adding value for players and fulfilling additional needs not normally covered by an average game. One of the pathways to a Blue Ocean is following trends and becoming involved with an eye to where the natural conclusion of that trend would be. In other words, being involved but not taking extreme risks. This is another area Rockstar excels in. Take mobile and social gaming, two of the fastest growing segments in the industry. In both cases, Rockstar is there prominently, with Grand Theft Auto: Chinatown Wars their latest mobile release (the first mobile GTA game was released for the PSP in 2005) and Red Dead Redemption Gunslinger on Facebook. Rockstar clearly looks beyond their games and at what is happening in the industry. 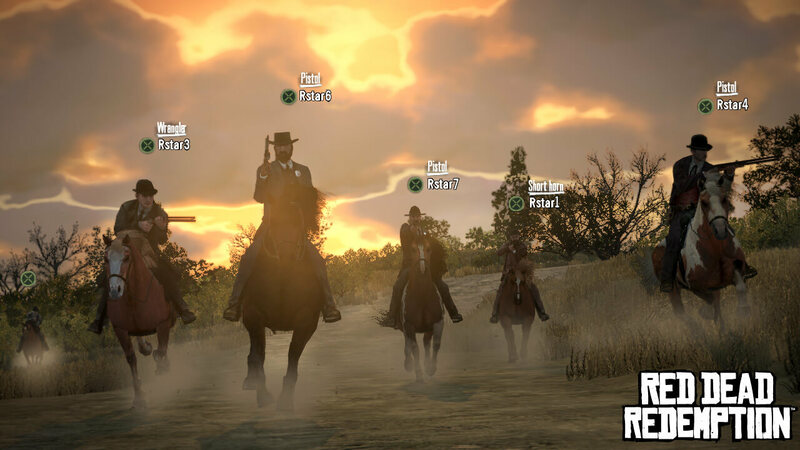 DLC is certainly a trend as described above, but Rockstar has demonstrated such expertise in the development and release of DLC for Red Dead Redemption that it deserves a special mention. In Rockstar’s hands, DLC is a tool to make money, generate press and engage players. By offering substantial DLC “packs” that are frequently and consistently released, the company ensures that each release generates additional press coverage and serves to further engage players – string them along in other words – by adding value over time, keeping each new addition fresh and exciting. 4. Multiplayer – a Result of Reaching Across Strategic Groups? It’s also worth briefly mentioning GTA IV’s and, especially, Red Dead Redemption’s multiplayer. Another pathway to a Blue Ocean is implementing features from strategic groups in an industry. In the case of these two games, features from MMO games are integrated into the multiplayer experience, resulting in a richer multiplayer experience and a more unique product. Rockstar may not have reached a Blue Ocean –yet? – but there is clearly deep strategic thought going into their game design. While a Blue Ocean Strategy is much more detailed and technical than described here, it appears that Rockstar’s strategic thought in game design is consistent with a focus on value innovation as described in Blue Ocean Strategy. And yes, that’s one of the ways Rockstar rocks it.